Lawmakers work to pass a bill that would end the first government shutdown in 17 years and prevent the government from defaulting on its debt. The world reaction to the debt deal was one of relief Thursday, but but there were signs the drawn-out process has undermined confidence in America's global standing in both finance and politics. The International Monetary Fund (IMF) urged Washington to build a more stable management of U.S. finances, mindful that Wednesday night's deal only suspends the debt limit until Feb. 7. Asian money markets rose after the deal, but key European markets fell in early trading, Reuters reported. Office of Management and Budget director Sylvia Mathews Burwell told federal employees to expect to return to work on Thursday morning. Federal employees who were furloughed as a result of the shutdown will receive back pay "as soon as practicable," according to the bill's text. The bill will fund the federal government through Jan. 15 and extend the government’s borrowing power through Feb. 7. It also calls for a congressional agreement by mid-December on a long-term budget plan. After a long and tedious process, the Senate compromise is only a short-term deal allowing the federal government to operate through January 15, and conservatives who fought to de-fund or delay Obamacare have had to concede defeat. NBC's Kelly O'Donnell reports. After more than two weeks of standoff over the government shutdown, Republicans -- faced with Thursday’s debt ceiling deadline -- were forced to accept a deal with only minor concessions from Democrats. After the Senate vote, Sen. Chuck Schumer, D-N.Y., called the occasion "a somber day," noting the effects of the shutdown on Americans. "The bottom line is millions suffered. Millions didn’t get paychecks. The economy was dragged down, and confidence and faith in the United States' credit -- and in the United States itself around the world -- was shaken," he said. The defeat for the GOP after both chambers spent days warring over competing budget proposals. 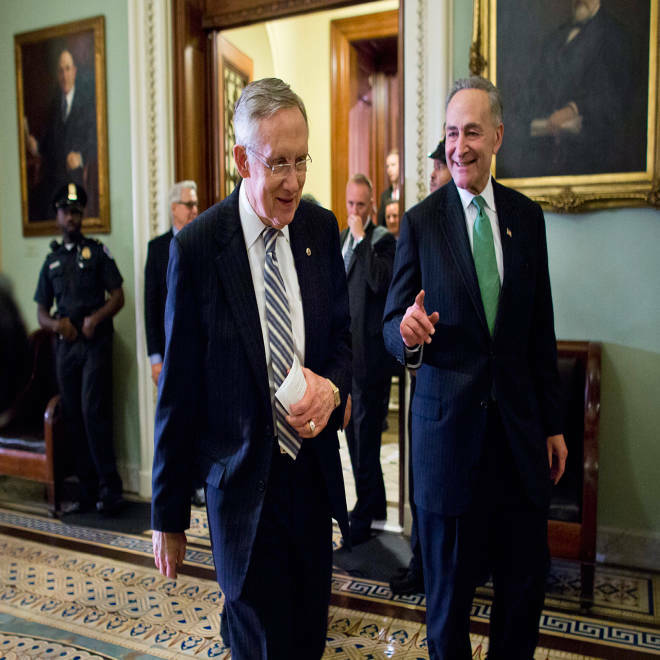 An eleventh-hour GOP plan in the House collapsed late Tuesday night, leaving lawmakers with no option except to take up a compromise framework crafted by Democratic Senate Majority Leader Harry Reid and Republican Minority Leader Mitch McConnell. Sen. Ted Cruz, R-Texas, slammed fellow Republicans in the upper chamber for “directing their cannon fire” at conservatives in the House, who repeatedly rejected proposals that they said didn’t do enough to gut the president’s health care law. Sen. Mike Lee of Utah, a close ally of Cruz, argued that Republicans were right to fight the shutdown battle over opposition to Obamacare. "Even if victory seemed difficult or impossible, that wouldn't excuse me or anyone else from doing the right thing," he said. "Avoiding difficult battles is, after all, how we ended up in this kind of mess. Sen. Ted Cruz, R-Texas, speaks on the chamber floor Wednesday evening to oppose a plan to fund the government and raise the debt ceiling. The passage of the new temporary funding bill became clear earlier Wednesday, when House Speaker John Boehner formally announced that Republicans will not oppose the bill en masse. Boehner and other Republican lawmakers had come under pressure to reach an agreement as the impasse roiled stocks in recent days. Ratings agency Standard and Poor’s estimated Wednesday that the shutdown “shaved at least 0.6% off of annualized fourth-quarter 2013 GDP growth.” That works out to a $24 billion bite out of the American economy, a number that House Minority Leader Nancy Pelosi cited on the House floor before the vote. Kelly O’Donnell, Frank Thorp and Alexander Smith of NBC News contributed to this report.